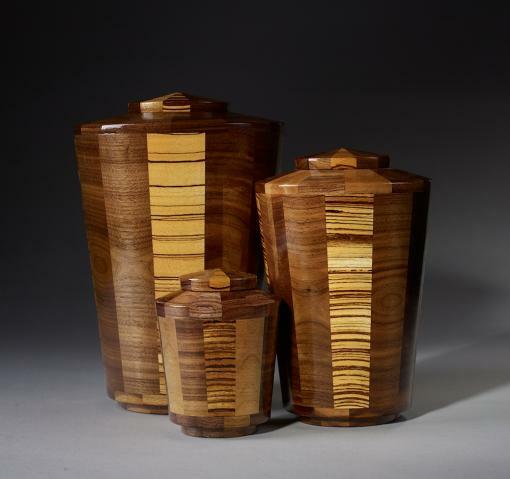 Part of our cost-conscious Eternal Promise Line, the Almighty is a classic-looking cremation urn featuring a mix of beautiful browns and tans created by mixing Black Walnut and Zebrawood. The Almighty is available in keepsake, small, and large sizes, so the wooden urn can serve as celebration of life to the memory of pets, children, and adults. Urn jewelry is available separately at Etsy Charmed Wife Shop. My brother and I were searching for a unique and customized Urn for our father. When we found Steve Shannon's website we were blown away. My dad loved wood work and the Almighty Urn was the perfect piece for us. 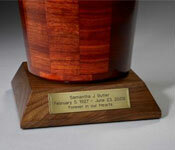 Knowing each Urn is custom it didn't take long for us to receive our order. They told us when Steve was working on our piece and when it was going to be shipped out. You knew exactly where your Urn was at throughout the whole process. When we received our Urn we were truly taken back. It is everything we could have imagined for our father. We love it! You have a customer for life. Thank you so much! Although this was a very difficult item to look into and purchase, I was relieved when I stumbled upon Steve Shannon collection. I immediately knew this was the right choice. I received an email in the process and it was shipped very promptly. The workmanship is everything I had hoped for. Thank you for making this decision a less sad one and thank you for the donation of a tree in memory and to Honor my Father. What a wonderful added touch to the already wonderful experience. I would highly recommend your urns and keepsakes to all!